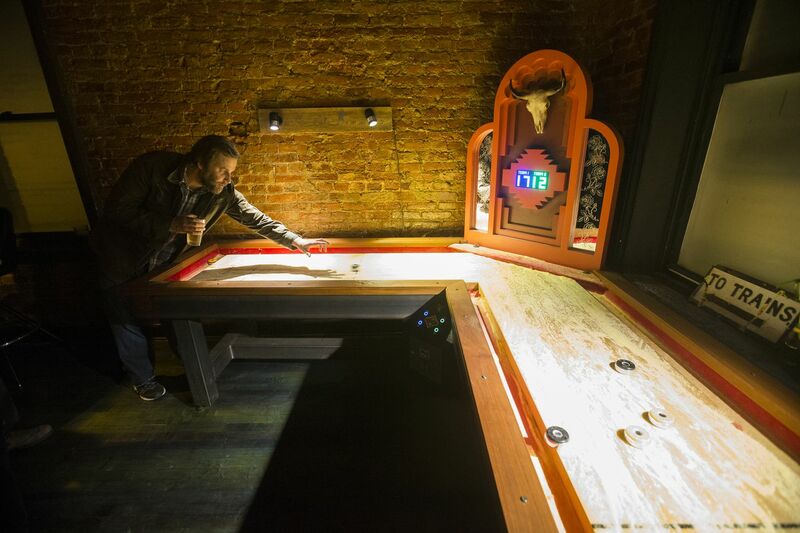 Mark Knobelsdorf plays table top shuffleboard in the upstairs bar at The International in Kensington on Nov. 2, 2018. When you name a bar Shenanigans, you pretty much know what to expect — like the unfortunate night I watched a hapless, drunken soul demand another man step outside to engage in the world's most anticlimactic bar fight, then stand forlornly in the dim light under the El, begging passersby to help him find his eyeglasses. So I was startled to venture into the Kensington space and observe how a few subtle changes, along with some drastic ones, have transformed it into the International Bar, a space that is very nearly shenanigans-free. On weeknights, it's the low-key corner bar every neighborhood deserves. On weekends, it's a buzzing cool-kid destination, with a DJ spinning vinyl in a dedicated alcove and foodie credentials, like its own house rye whiskey and a 24-tap Cruvinet devoted to vermouths and sherries. I shouldn't have been surprised, given its ownership: William Reed and Paul Kimport, the team that opened Standard Tap in 1999 ahead of Northern Liberties' resurgence, then created Johnny Brenda's in Fishtown in 2003, long before anyone thought of the intersection of Frankford and Girard as a nightlife mecca. In that context, the recently renovated bi-level space by the El seemed almost too obvious, said Reed. He told Kimport: " 'I know, it's not our thing — it has an alarm system and sprinklers.' We had to get over ourselves a bit." The downstairs bar at the International in Kensington. They opened in June, designing a bar for people who work in the neighborhood's thriving restaurant industry. One giveaway of that target demographic is that the kitchen serves until 1 a.m. Another is that the concise drink menu makes room for a Fernet-and-cola cocktail, an inexplicable bartender obsession. Then there's the draft list, with offerings like a sour Berliner Weisse from Milford, Del. 's Mispillion River Brewing, and a California Hop Concept double IPA, designed as though for the jaded eye of someone who has seen a lot of locally focused beer lists (like the one pioneered at Standard Tap) and who just doesn't want another Victory Prima Pils right now. Cocktails include classics like the Last Word and Penicillin, along with creations like a Navy-strength-rum drink called the Jenkins — which the bartender promises is akin to a Manhattan, but which tastes more like sweet, pot-stilled jet fuel. I prefer the Cup of Ambition, a tequila-and-grapefruit drink interestingly paired with rosemary, or the pleasantly juicy herbal Ramble, Tamble, Bramble, made with local Rowhouse aquavit, blueberry jam, and lemon. The Jenkins, a signature cocktail at the International Bar in Kensington, is made with Smith & Cross rum, vanilla, and sweet vermouth. The food menu commits to the same premise that guided many of my guy friends through their college years: It's built to avoid what Kimport calls the "tyranny" of cutlery, instead relying on finger food and skewers. But it's foodie finger food: a hunk of seared halloumi with fig; a slab of deep-fried Kidchego is what a mozzarella stick wants to be when it grows up; a little plate of gildas, briny frankenfood comprising a spicy-sweet pepper speared through a green olive wrapped in a cured anchovy. The idea, said Reed, was to create something entirely original, which is why there's not an Edison bulb or a slab of poured concrete in sight. Instead, they left the decor downstairs minimal, upgrading to Peg & Awl-upholstered industrial bar stools and a mirrored backbar with liquor bottles sorted by color, like the bookshelves in a home-design magazine. Upstairs, it's a midcentury-modern, futurist fantasia: a bar that looks like a riveted airplane wing; geode-like amber pendant lamps; a vintage, illuminated Geochron world clock; a showy, L-shaped shuffleboard table; and, against one wall, a garish masterpiece in fiber-optic, Chinese-restaurant decor that Reed had transformed into custom sign for Service Bar rye. "We just build what we like and hope other people like it, too," Reed said. On a Tuesday, I found a crew of regulars half-watching The Lost Boys on mute, sipping craft cocktails and asking one another the important questions, like, "Which one was Keanu Reeves: Bill or Ted?" On a Saturday, the crowds grew thick with date nights, groups of coworkers, and the occasional crowd of selfie-snapping partiers who crowded around my table — one plopping a giant Louis Vuitton bag on it before passing around pills from a prescription bottle to her friends. It turns out shenanigans are hard to stop. Paul Sukeena mixes a drink at the upstairs bar at the International in Kensington. When to go: If you can, make it for happy hour, which runs 4-6 p.m. weeknights: select beers, cocktails, and snacks are $5. Otherwise, it's open 11 a.m.-2 a.m. Tuesday-Sunday; the upstairs bar opens 6 p.m.-2 a.m.
Order: Try the Ramble, Tamble, Bramble ($12) or go for a flight of two small pours of fortified wine to compare. Bathroom situation: A clean, spacious, single-stall affair. Sounds like: There's a rotating crew of DJs spinning vinyl most nights, so the soundtrack varies. On a recent visit, it was a rowdy 104 decibels of mostly 1970s rock downstairs, while upstairs the more eclectic mix ranged from Mac Miller to the Talking Heads.